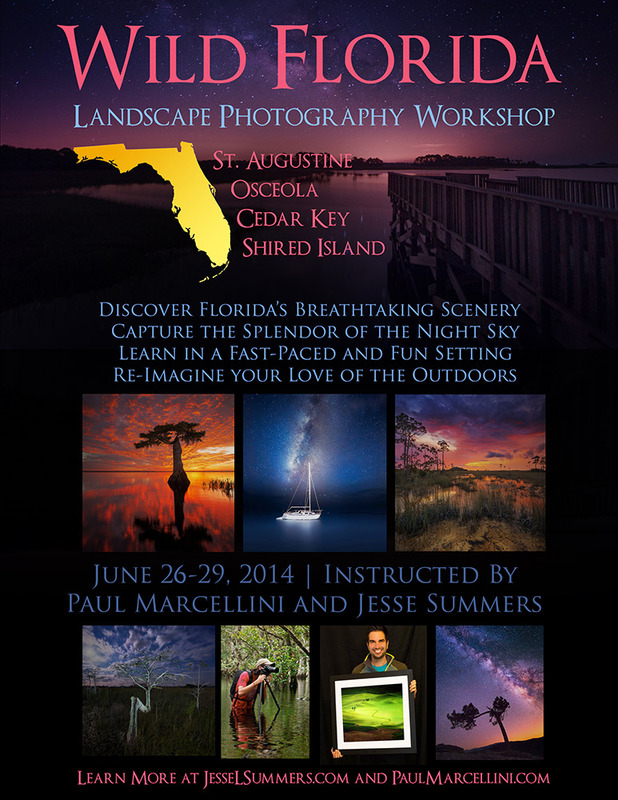 Photographers Paul Marcellini and Jesse Summers invite you to join them on the most exciting and in-depth landscape photography workshop ever realized in the State of Florida. Over the course of four action-packed days, we will chase the light from coast to coast- capturing dynamic and breathtaking sunrises, sunsets, and night landscapes. Our first stop is the coquina formations of Marineland- learning how to tame the movement of water and rapidly-changing light to create compelling seascape images. Then, we will venture inland to a mid-Florida forest and lake to create some stunning natural images. The third day brings us to remote Shired Island, where we'll discover an otherworldly marine nightscape of gnarled trees and bioluminescent visitors. We'll conclude our adventure in idyllic Cedar Key; we'll capture an iconic salt marsh sunset. This is the first and only collaborative effort of acclaimed photographers Paul Marcellini and Jesse Summers. Both have been published in numerous magazine and web sources, and are highly respected in the fields of landscape and nightscape photography. Combining their expertise to assist your photographic ambitions, this is a workshop you can't afford to miss. During the day, we'll review the basics of composition and post-processing. We'll learn how to discover tantalizing compositions and execute your vision with precision. You'll receive one-on-one guided instruction throughout the four days, pushing your photography abilities harder than you have before. Both Jesse and Paul are seasoned workshop leaders and by combining their knowledge and expertise, you'll have the opportunity to capture the image of your lifetime. Spots are highly limited, so make sure that you take advantage of this introductory offer! In this workshop, you’ll learn the most difficult and one of the most exciting facets of landscape photography: capturing landscapes at night with the stars overhead. Additionally, we’ll have the opportunity to capture remarkable sunrises and sunsets, learn about the basics of landscape photography composition and post-processing in Adobe Photoshop or Adobe Lightroom, and learn some basic astronomy to help you prepare for your photography experience. We’ll re-learn photography’s “infernal triangle” of aperture, ISO, and shutter speed as it relates to landscape astrophotography as well as covering the principles behind blended exposure images.